NANCY MALMED is the Founder and Artistic Director of Wissahickon Dance Academy and the Executive Director of International Ballet Exchange in Philadelphia. She has been on the faculty of Temple University’s Dance Department, has performed professionally as soloist with Contemporary Dance Theater, LaSalle Music Theater and Pro Musica and has been teaching the Vaganova method of classical ballet since 1979. In 2007 she served as judge for the International Ballet Competition "Artek Fouette" in Crimea, Ukraine and has also been selected to serve on local grant panels. In this fine series of cds Mrs. Malmed presents concert quality musicianship in lengthened bands of music in order to bring the excitement of live music into the studio. Twenty musical selections appropriate for all levels, beginner through advanced. Selections by Chopin, Faure, Grieg, Brahms, Czerny, Mendelssohn, Joplin and Mozart. Pianist - Nicholas Mastripolito. 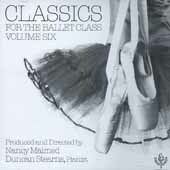 19 selections, ideal for beginner through advanced for barre and centre. Music by Chopin, Bach, Joplin, Schubert, Stravinsky, Berlioz, Debussy, Drigo, Strauss and others. By Nicholas Mastripolito & Peter Helm. Excerpts from ballets such as Drigo's "Le Corsaire" and Minkus' "Don Quixote" and operas such as Bizet's "Carmen" and Verdi's "Il Trovatore." Also includes Chopin, Schubert, Grieg, Brahms & more. 19 selections ideal for all levels. An impeccable performance by pianist Duncan Stearns. Ideal for all levels of classes. Features works by Mendelssohn, Bach, Tchaikovsky, Schumann, Ravel, Gershwin and more. Ideal for all class levels, Duncan Stearns performs 19 works by Chopin, Bach, Mendelssohn, Albeiz, Beethoven, Tchaikovsky, Rachmaninoff, Corelli, Levitski, Delibes and Brahms. Two full ballet classes played by Tatyana Krivitsky, appropriate for all levels. Longer than usual bands. Composers featured are: Rebikoff, Minkus, Glazounov, Strauss, Khachaturian, and more.